Sunday’s Game 7 of the NBA Finals was as much a battle between Under Armour and Nike as it was between the Warriors and the Cavaliers. Two of the greatest athletes currently in the NBA, Stephen Curry of the Golden State Warriors and LeBron James of the Cleveland Cavaliers, are represented by two of the largest retailers in athletic wear — Under Armour and Nike, respectively. The Warriors, Curry, and Under Armour all lost Game 7, but Under Armour just got upgraded to a buy by the Buckingham Research Group despite the disappointing performance. “We believe Under Armour is the best growth story in consumer,” Scott Krasik, an analyst at the Buckingham Research Group, said in a research note. Signing Curry was a huge coup for Under Armour, and some analysts have priced the athlete as a $14 billion opportunity for the brand. 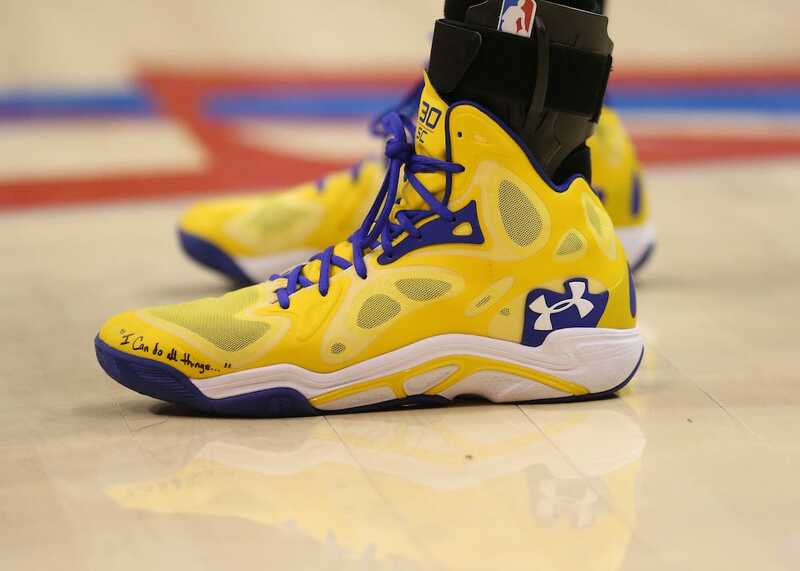 Curry’s newest shoes are a good example of this upside. Even though they were mercilessly mocked on social media, the new shoes are hitting their target demographic exactly as planned and have created a lot of buzz around Under Armour. But the apparel company’s advantages don’t all originate from its athletes. The company has been spending heavily on advertising recently, focusing on growth instead of a sound longer-term operating structure, according to Krasik. But as the brand starts shifting its focus to those longer term issues like its supply chain, it begins to look like a bigger and bigger rival to competitors like Nike. The most telling evidence of Under Armour’s potential upside comes from looking at earnings. As the company begins to spend less on advertising, increase it’s distribution, and reap the rewards of social and celebrity endorsement, earnings will jump and the share prices will reflect that, according to Krasik. Of course, some analysts think the company is still over valued. Krasik thinks it’s set for a slam dunk. Shares for the company are up more than 3% in early trading Monday.